Hi All, purchased a MT Labelle 43 a few months back and have done a lot of work to bring her to live aboard status. We moved in two weeks ago and are loving it. My question is this: do any other marine trader owners have a picture of the Curtain Lights that were installed in the Aft Cabins of these boats? Mine were removed and I would like to replace them, but I have no idea what the fixture looks like. these lights, 3 on each side of the boat, are controlled by a combo switch next to the bed that reads Curtain Lights. This switch also turns on the Candelabra fixture which is on the aft bulkhead. Welcome aboard. Chances are you will not be able to get the original lights. Probably wouldn’t want them anyway since there have been so many improvements in 12 volt lighting. I would find some LED lights that will fit and have the color of light that you like and go with them. They will save you a lot of power in the long run over incandescent lights. What the heck are curtain lights?? Curtain lights? Do I need those? Only if your curtains are afraid of the dark. Yes I would replace them with LED, I am just interested in seeing the original fixtures/what they looked like. I have already upgraded all of the original fixtures, that are left, to LED and saved a ton of amperage. Love this boat, she is my Baby. Thanks Comodave! 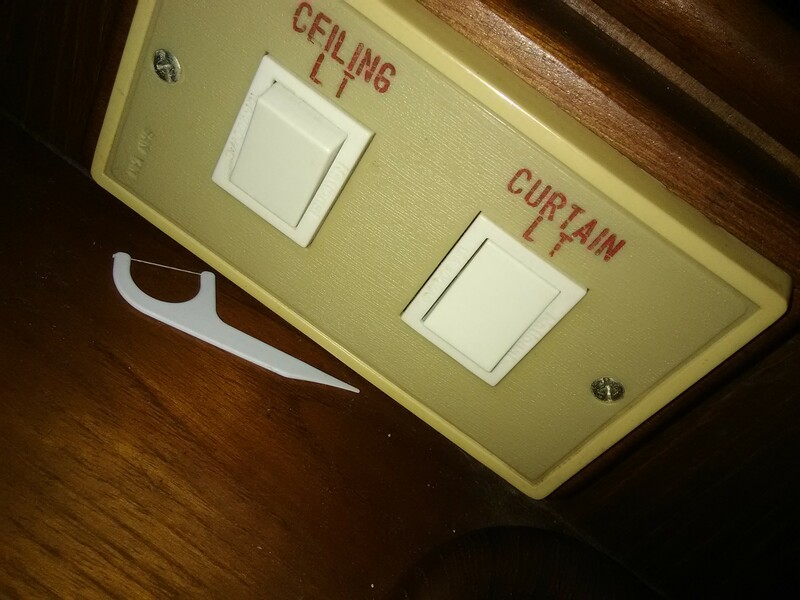 This is why they are called curtain lights, because the switch says so! I just threw all of mine out on my CHB 35. I doubt they were original though, since there was blank wires at the very end of each section.